Miso is a fermented paste made with soybeans, sometimes with the addition of rice or barley. Salt and a starter called Koji, are added to the whole mix which is then left to ferment for anything from 6 months to a few years. There are different types of Miso and they can be classified according to where in Japan they’re produced, according to their strength/colour as well as the ingredients used. Generally, unless you intend to have a pantry full of different types of miso, the most important thing to note is the colour and therefore the strength of the Miso paste. Essentially, the darker the miso, the older, the saltier and stronger in flavour it is. Conversely, the lighter coloured ones are milder and border on the slightly sweet, which of course makes them perfect for lightly flavoured soups. Of course, there will always be exceptions to this rule but as a general guide to miso buying and use, it will suffice. 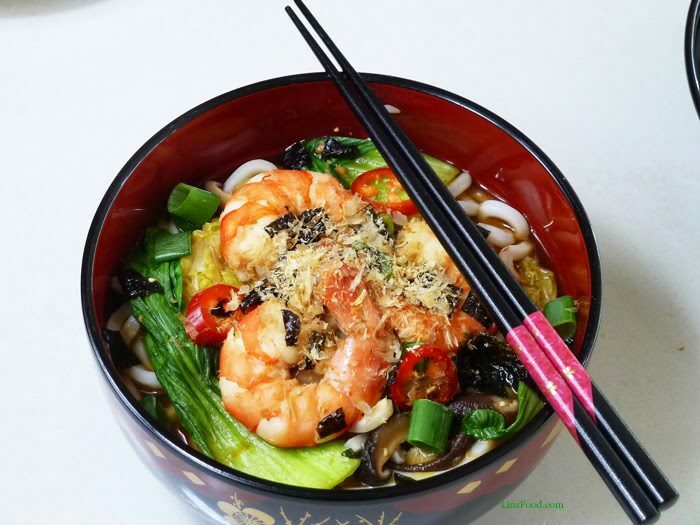 It is only in recent years that the West has cottoned on to something people in the Far East have known for generations – Miso is a wonder food! An important thing to remember when using miso is that it is “alive”; being a cultured food, it does not want to be boiled. Miso should never be cooked over 48˚C/118˚F, any higher than that and you are going to be killing off all that natural goodness. I always take the pot off the heat, let it sit for 5 minutes before adding the miso. The best way to add miso paste to soups or stews is to dilute it slightly with a little of the soup in a bowl or cup before adding it to the pot – this prevents unnecessary lumps. Instead of providing you with an exact recipe, I shall instead suggest the ingredients you can use, starting off with 2 basic ingredients. However, one that I make often: potatoes, ginger, onions, cabbage, shiitake, spinach and Nori (seaweed) torn & added after the miso. Serve with brown rice, a simple but nutritious meal, especially after a detox day. 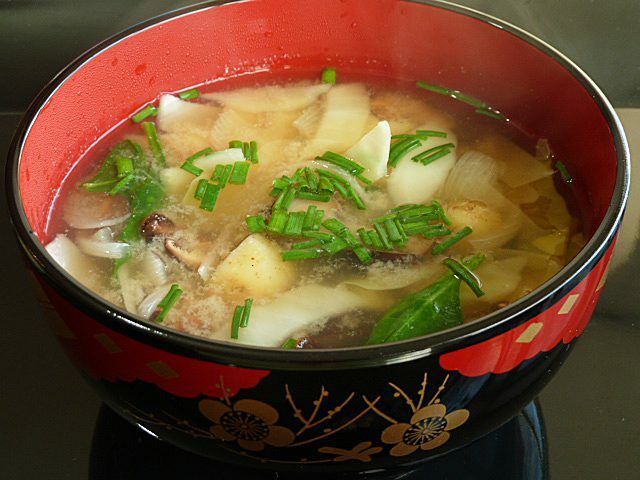 Potato and Onion Miso Soup is a very common one in many Japanese households for its simplicity & use of staple ingredients. If you do want an exact recipe, here’s one, just click on the image. Miso paste – lighter colour would have a milder taste, generally, perfect for first timers! Dashi – would be ideal, otherwise, any ordinary additive free stock (homemade would be good) or even just plain water. Dashi recipes: Part 1 & Part 2. How to make Dashi? Here’s my YouTube video. Recipe suggestions for various miso soups. Miso is a fermented paste made with soybeans, sometimes with the addition of rice or barley and is full of goodness. Cook any hard ingredients or meat first, once they're cooked, add the quick cooking one like the vegetables. Once cooked, take off heat, wait 5 minutes, then dilute a little of the miso paste in some of the soup in a cup, before adding to the rest in the saucepan. Thank you for mentioning miso’s health benefits thoroughly and my post! Is your bowl in urushi? Wow! Thank you, and yes, it is! One of my favourite bowls, it’s so pretty!